Docket No. 150026-WS – Complaint by Eagleridge I, LLC against Lake Utility Services, Inc. for declaration that connections have been made and all amounts due have been paid, and mandatory injunction requiring refund of amounts paid under protest. Eagleridge I, LLC (Eagleridge), is a Florida Limited Liability Company which develops properties in Lake County, Florida. 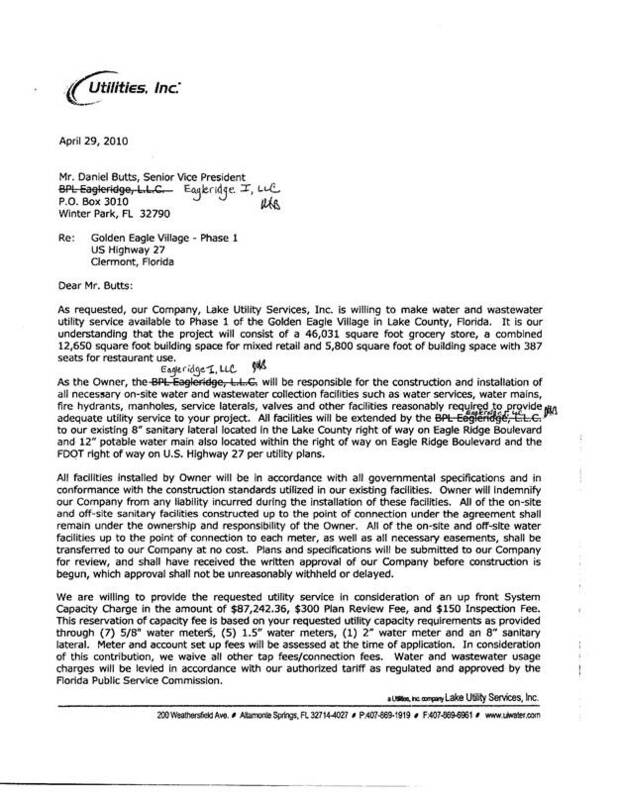 Lake Utility Services, Inc. (LUSI), is a utility company providing water and wastewater service in Lake County, Florida, and is a wholly owned subsidiary of Utilities, Inc. Eagleridge developed a parcel of commercial property (the Development) located on U.S. Highway 27 in Clermont, Florida. The Development is commonly known as Golden Eagle Village, which consists of a Publix-anchored shopping center. In consideration of this contribution, [LUSI] waive all other tap fees/connection fees. Water and wastewater usage charges will be levied in accordance with our authorized tariff as required and approved by the Florida Public Service Commission. Eagleridge proceeded with the Development, including obtaining all necessary permits. On August 10, 2010, Eagleridge applied for a Florida Department of Environmental Protection (DEP) permit to construct a wastewater collection line from the utility’s existing collection system to the Development. In March 2011, Eagleridge submitted to DEP its Request for Approval to Place a Domestic Wastewater Collection/Transmission System into Operation. A copy of the Request for Approval is attached as Attachment B. 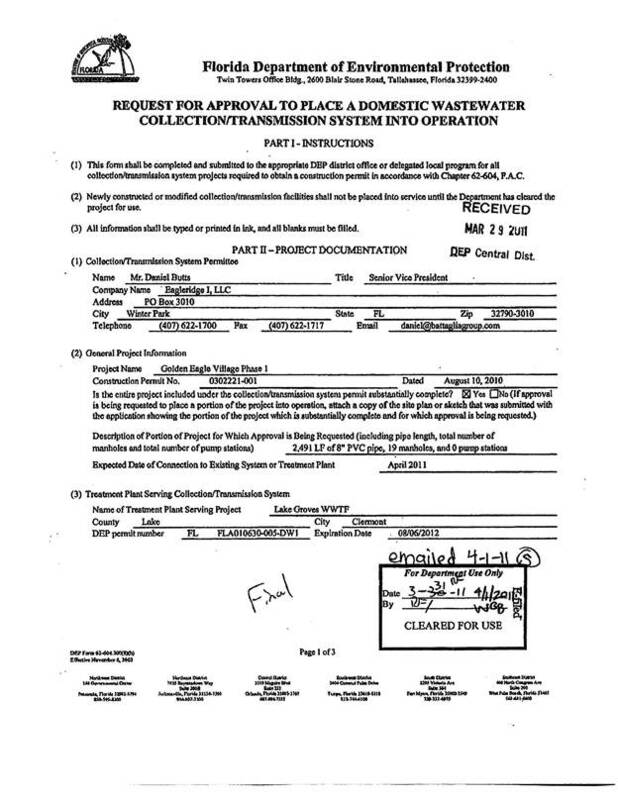 On March 18, 2011, Patrick Flynn, LUSI’s Regional Director, signed the Request for Approval certifying to DEP that all connections to LUSI’s wastewater facility had been completed to LUSI’s satisfaction. 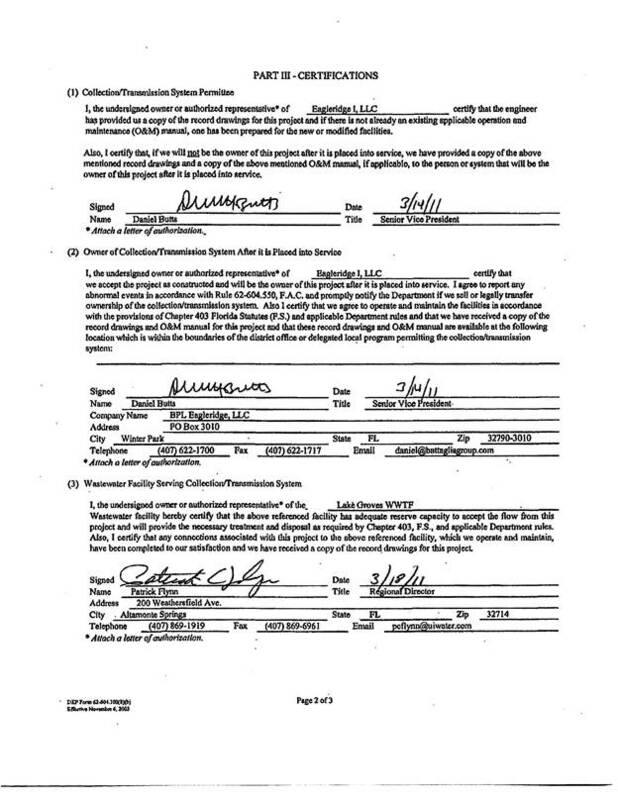 On March 31, 2011, the DEP granted Eagleridge’s application and the connection between the Development and LUSI’s wastewater system was completed in April 2011. On November 3, 2011, the Commission granted LUSI’s application for increase in water and wastewater rates. Before the Commission revised LUSI’s main extension charge, the main extension charge was negotiable. The Commission also revised the utility’s water plant capacity and water and wastewater main extension charges. According to the order, LUSI’s wastewater service availability policy provided that developers would install new collection lines and donate them to the utility. The Commission approved a wastewater main extension charge that would allow the utility to collect the appropriate charge from a single property owner in lieu of donated lines. On March 4, 2013, LUSI wrote a letter to Eagleridge stating that the Commission granted LUSI the right to increase its wastewater main extension charge. LUSI’s letter further stated that the new charge applied to the balance of the prepaid capacity fees for units that had yet to be connected for service. LUSI requested an additional main extension charge of $63,625.20 based on the new main extension charges of $4.44 per gallon ($1,243/280 gallons per equivalent residential connection) and 14,330 gallons of reserved capacity yet to be assigned. The March 4, 2013, letter is attached as Attachment C.
The parties dispute whether LUSI is entitled to charge the increased wastewater main extension charge to Eagleridge. Eagleridge, relying on Rule 25-30.475, Florida Administrative Code (F.A.C. ), argues that LUSI “may not charge the fees for services rendered or connections made prior to the effective date of the PSC Order.” The parties unsuccessfully attempted to resolve the dispute. Eagleridge, under protest, paid the increased fees to LUSI. Eagleridge has recently sold the Development, but Eagleridge has retained all rights to pursue and recover a refund of the subject disputed fees. On January 8, 2015, Eagleridge filed a complaint with the Commission requesting (i) a declaration that the fees are not applicable to Eagleridge where connections already have been made; (ii) a declaration that all amounts due and owing for service availability charges and connection fees have been paid by Eagleridge; and (iii) an order directing LUSI to immediately refund all monies paid under protest. On January 20, 2015, LUSI filed a response to Eagleridge’s complaint with the Commission. Staff, in order to facilitate the review of the complaint filed by Eagleridge, issued a Data Request to LUSI. LUSI responded to staff’s Data Request by letter. On April 3, 2015, Staff held a conference call for the parties to discuss the complaint. Eagleridge subsequently filed a supplemental filing in response to LUSI’s answer to the complaint, LUSI’s answer to staff’s first data request, and LUSI’s response to staff’s questioning during the conference call. The Commission has jurisdiction over this matter pursuant to Chapter 367, Florida Statutes (F.S.) and Rule 25-30, F.A.C. Did Lake Utility Services, Inc., appropriately charge increased fees to Eagleridge I, LLC? To determine whether LUSI appropriately charged increased fees to Eagleridge, staff reviewed the Contract, supporting documents, the date of connection, and Commission Rules. Both parties believe, pursuant to Rule 25-30.475(2), F.A.C., unless authorized by the Commission and provided that customers have received notice, non-recurring charges, such as service availability charges, shall be effective for service rendered or connections made on or after the stamped approval date on the tariff sheets. Staff believes the crux of this complaint is whether the wastewater connection was completed prior to the new wastewater service availability charge ordered by the Commission. Eagleridge believes that the wastewater main extension charge of $63,625.20 paid to LUSI under protest should be refunded because the Development was connected to the utility’s collection system in April 2011, prior to the Commission approving a new main extension charge for LUSI in November 2011. To support its argument, Eagleridge argues that (1) the contract provided that all other tap fees/connection fees would be waived in consideration of Eagleridge’s payment of the service availability charges, (2) all connections to LUSI’s wastewater system were made in April 2011 prior to the increase in service availability charges, and (3) LUSI was explicitly prohibited by Commission Rules and Order No. PSC-11-0514-PAA-WS (November 2011 Order) from charging the new service availability charge. Eagleridge argues that Rules 25-30.210, and 25-30.515, F.A.C., and Eager v. Florida Keys Aqueduct Authority, 580 So. 2d 771 (Fla. 3d DCA 1991), support their request for refund. Pursuant to Rule 25-30.210(4), F.A.C., “service pipe” is defined as the pipe between the utility’s main and the point of delivery, including the “pipe, fittings, and valves necessary to make the connection excluding the meter.” Eagleridge argues that Rule 25-30.210(6), F.A.C., applies because the Rule provides that “point of delivery” is where the service pipe is connected to the utility company’s main. Regarding service availability policies or contracts, Rule 25-30.515(1), F.A.C., provides “active connection means a connection to the utility’s system at the point of delivery of service, whether or not service is currently being provided.” In August 2010, Eagleridge applied for a DEP permit to construct a wastewater collection line from the utility’s existing collection system to the Development. In March 2011, Eagleridge submitted its Request for Approval to Place a Domestic Wastewater Collection/Transmission System into Operation to DEP. DEP approved Eagleridge’s request to place its wastewater main extension to LUSI’s collection system into service. In consideration of this contribution, we waive all other tap fees/connection fees. Water and wastewater usage charges will be levied in accordance with our authorized tariff as required and approved by the Florida Public Service Commission. Further, Eagleridge argues that, pursuant to Eager, the Commission should apply the “plain and unambiguous language in the [F.A.C.] to find that the connections were completed when LUSI’s service pipe was connected to Eagleridge’s piping.” Eagleridge argues that “LUSI is requesting that the [Commission] ignore the plain language of the [F.A.C.] under the guise of ‘interpretation.’” Eagleridge believes that the Commission is obligated to apply the plain and unambiguous language of the F.A.C., which provides that a connection is completed when the utility’s service pipe is connected with the customer whether or not service is currently being provided. LUSI believes that it is entitled to collect the wastewater main extension charge approved by the Commission for the portion of the Development not yet receiving water service. To support its argument, LUSI argues that (1) the utility did not waive the right to collect the increased charges and (2) not all connections had been made when the increased charges were implemented. LUSI references H. Miller & Sons v. Hawkins, 373 So. 2d 913 (Fla. 1979), and Rules 25-30.210, and 25-30.515, F.A.C., in support of their arguments. Citing H. Miller & Sons v. Hawkins, LUSI argues that contracts with public utilities are made subject to the reserved authority of the state, under the police power of express statutory or constitutional authority, to modify the contract in the interest of the public welfare without unconstitutional impairment of contracts. Regarding the waiver contained in the Contract, LUSI believes Eagleridge “misconstrues the waiver language” in that the “meaning of the waiver is that LUSI waived any other tap fees/connection fees that were in existence at that time” and “there is no significance in the language regarding usage charges.” LUSI argues that the waiver language relates to any other tap fees/connection fees that were in existence at the time the contract was signed. While LUSI believes that “[a] connection is not a connection for purposes of applying increases in service availability charges unless service has been previously implemented . . . the actual cost of maintaining sufficient capacity cannot be determined until the date that service actually initially commences.” LUSI argues that “unless water service is active there can be no wastewater flow and therefore, no wastewater service is provided.” LUSI contends that a connection within the Eagleridge Development occurs only when a meter is installed after service is requested. Increasing service availability charges prevents current customers from subsidizing costs associated with future plant capacity. Referencing Rule 25-30.515(9), F.A.C., LUSI argues that Guaranteed Revenue Charges are designed to help the utility recover part of its cost from the time capacity is reserved until a customer begins to pay monthly service rates. Pursuant to the Contract, Eagleridge paid an up-front System Capacity charge, Plan Review Fees, and Inspection Fees to LUSI. 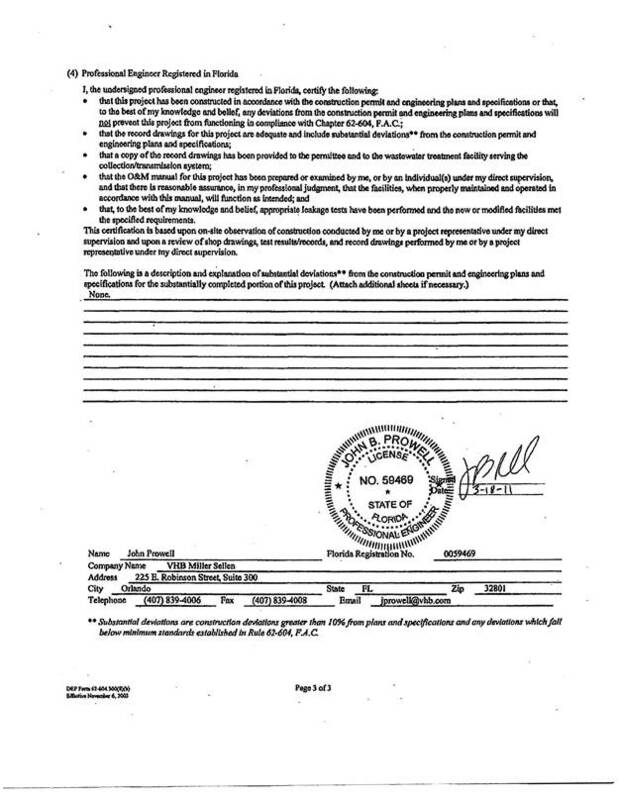 The Contract included language which Eagleridge believes is a waiver of additional “tap fees/connection fees,” in pertinent part: “[i]n consideration of this contribution, [LUSI] waive all other tap fees/connection fees. 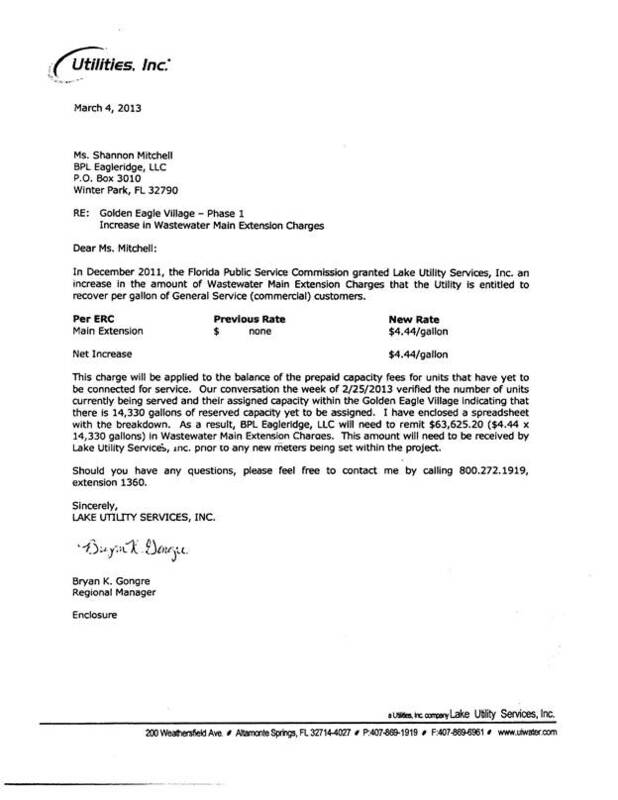 Water and wastewater usage charges will be levied in accordance with our authorized tariff as required and approved by the Florida Public Service Commission.” LUSI argues that the waiver language related to any other tap fees/connection fees that were in existence at the time the contract was signed. Pursuant to 367.011(2), F.S., the Commission has “exclusive jurisdiction over each utility with respect to its authority, service, and rates.” Staff believes that the waiver language in the Contract would be insufficient to prevent LUSI from collecting fees when appropriate. The change the Commission approved in the utility’s wastewater main extension charge in November 2011 was merely to provide a charge that would be applicable to individual customers. Prior to the November 2011 Order, the utility’s approved main extension policy allowed the utility to receive donated lines from a developer, but did not address the appropriate charge for a wastewater customer connecting to a main constructed by the utility. In that Order, the Commission approved a wastewater main extension charge that would allow the utility to collect the appropriate charge from a single property owner in lieu of donated lines. Therefore, the main extension charge was not intended to be collected from a developer, such as Eagleridge, who constructed and donated a collection line to the utility. Staff believes this means that since Eagleridge donated its lines, a charge cannot be assessed. Rule 25-30.210(6) and (7), F.A.C., define “point of delivery.” Staff believes that in this case the “point of delivery” for wastewater service is where the service pipe is connected to the utility company’s main, as defined in Rule 25-30.210(6), F.A.C. Subsection (7) addresses “point of delivery” for a water system; therefore, it does not apply to this docket. Pursuant to Rule 25-30.515(1), F.A.C., an “active connection means a connection to the utility’s system at the point of delivery of service, whether or not service is currently being provided.” Although it is LUSI’s contention than an active connection was not made, in March 2011, DEP approved Eagleridge’s request to place its wastewater main extension to LUSI’s collection system into service. The DEP approval included the consent and understanding of the utility. Staff believes that an active wastewater connection was made when the physical connection was completed, even though water service has not been provided to the entire Development. If DEP had not accepted the line into operation, staff believes, as mentioned above, that the terms in the Contract that parties refer to as a waiver would be insufficient to prevent LUSI from collecting fees. However, that is not the situation in this docket. To determine whether LUSI appropriately charged increased fees to Eagleridge, staff assessed the status of the Contract at the time the fees were levied. Pursuant to our rules, staff believes that the Contract was fulfilled because (1) Eagleridge paid the up-front System Capacity Charge, including the other fees identified in the contract, when signed in April 2010; (2) the main extension charge should not have been charged because Eagleridge constructed and donated a collection line to the utility; and (3) LUSI’s piping was connected to Eagleridge’s Development and both DEP and the utility signed off on the active connection. Thus, it was an error for LUSI to charge Eagleridge $63,625.20 in addition to what was contemplated in the Contract. Staff’s analysis would end here if LUSI did not raise the argument that H. Miller & Sons applies to this docket. LUSI argues that under H. Miller & Sons, Inc. v. Hawkins, LUSI is permitted to increase service availability charges because the Commission has authority to change rates in a private contract between a utility and developer. In H. Miller & Sons, the developer, H. Miller and Sons, Inc., entered into an agreement with Cooper City Utilities, Inc., to obtain water and sewer utility service for a 500-unit subdivision. In early 1975, Miller completed the payments in accordance with the agreement. However, not all of the homes were connected to the utility system. In late 1975, the Commission, in Order No. 6953, issued on October 9, 1975, in Docket No. 750368-WS, In Re: Application of Cooper City Utilities, Inc., For Approval of Tariff Modifications, authorized the Utility to increase its wastewater main extension charges. Staff believes that LUSI would be correct that H. Miller & Sons applies only if the connection with Eagleridge had not yet been made at the time the Commission granted LUSI’s application for increase in water and wastewater rates. Staff believes that H. Miller & Sons is not applicable in this case because three events occurred before the Commission granted a rate increase: (i) Eagleridge paid the up-front System Capacity Charge, including the other fees identified in the contract; (ii) LUSI’s piping was connected to Eagleridge’s Development; and (iii) DEP and the utility signed off on the active connection. Therefore, staff believes the Contract was fulfilled and LUSI charged increased fees to Eagleridge in error. Staff recommends that the Commission find that it was not appropriate for LUSI to charge increased fees to Eagleridge I, LLC. Issue 2: Is a refund appropriate? On March 4, 2013, LUSI requested that Eagleridge remit an additional $63,625.20 in Wastewater Main Extension Charges. Although Eagleridge disputed the amount, the company paid the amount to LUSI. As part of the complaint, Eagleridge has asked for the full $63,625.20 to be refunded back to them. If the Commission supports staff’s recommendation in Issue 1, the full $63,625.20 should be returned back to Eagleridge with interest, pursuant to Rule 25-30.360(1). In addition, Rule 25-30.360(2), F.A.C., contemplates that the refund amount should be returned within 90 days of the final Commission Order. Staff recommends that interest shall be calculated pursuant to Rule 25-30.360(4), F.A.C., to the amount of $1,737.32. If the Commission disagrees with staff’s recommendation, staff recommends that no refund is required. Therefore, Staff recommends that the full amount of $63,625.20, plus interest to the amount of $1,737.32, should be refunded to Eagleridge, pursuant to 25-30.360, F.A.C. Staff recommends that if the Commission supports staff’s recommendation in Issues 1 and 2, this docket should remain open until the completion of the refund to Eagleridge. Upon staff’s verification that the refund has been completed, this docket should be administratively closed. If the Commission disagrees with staff’s recommendation on Issues 1 and 2, this docket should be closed upon issuance of the Consummating Order. Document No. 00342-15, in Docket No. 150026-WS, Lake Utility Services, Inc.’s Answer to Complaint. Document No. 00817-15, in Docket No. 150026-WS, Staff Data Request. Document No. 00996-15, in Docket No. 150026-WS, Lake Utility Services, Inc.’s responses to the Staff’s First Data Request. Document No. 01788-15, in Docket No. 150026-WS, Memo to all parties and interested persons advising of a conference to discuss the complaint. Document No. 02038-15, in Docket No. 150026-WS, Eagleridge I, LLC’s Supplemental Filing In Response To Lake Utility Services, Inc.’s Answer To Complaint And Answer To Staff’s First Data Request And Response To Staff’s Questioning During April 3, 2015 Conference. Document No. 00148-15, in Docket No. 150026-WS, Complaint Requesting Declaration That Connections Have Been Made and All Amounts Due Have Been Paid and Mandatory Injunction Requiring Refund Of Amounts Paid Under Protest. H. Miller & Sons, 373 So. 2d at 915. Order No. 7650, issued February 21, 1977, in Docket No. 760299-WS, In re: H. Miller and Sons, Inc. v. Cooper City Utilities, Inc.
 Order No. PSC-01-0857-PAA-WS, issued April 2, 2001, in Docket No. 000610-WS, In re: Application for uniform service availability charges in Duval, Nassau, and St. Johns Counties by United Water Florida, Inc.